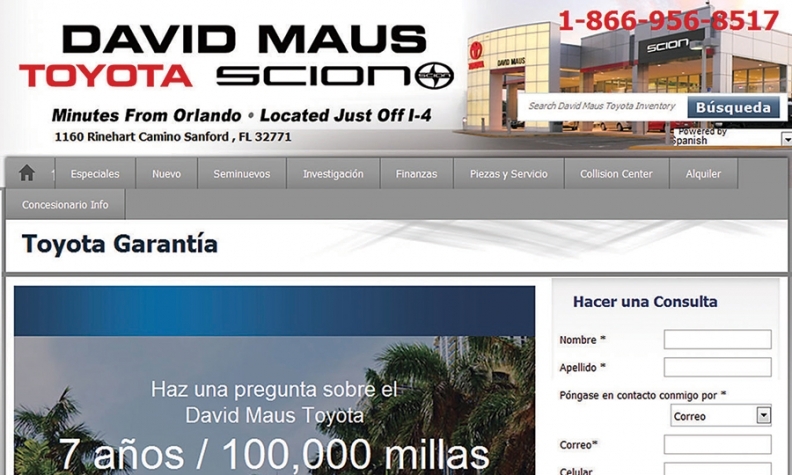 David Maus Toyota-Scion, near Orlando, expects to increase sales to Hispanic buyers by the end of the year by advertising in Spanish and posting Spanish-language car videos. TAMPA, Fla. -- With Hispanics buying nearly one in five new vehicles in the United States, dealerships that ignore them are missing a big opportunity, say dealers and marketing vendors. Ricky Lopez, Internet director at David Maus Toyota-Scion in Sanford, Fla., said dealerships can make a difference simply by advertising in Spanish and posting Spanish-language car videos. Lopez said David Maus Toyota, near Orlando, expects to dramatically increase sales to Latino buyers by the end of the year, largely by adopting that approach. He also is improving processes so Hispanic shoppers are matched with the right salespeople. Lopez joined the store about two months ago. He said that by Christmas, three of every four car buyers at the store will be Hispanic vs. about one in three today. Lopez said Hispanics tend to become loyal buyers once they "trust you, like you and come to like your dealership." David Maus Toyota, part of Berkshire Hathaway Automotive group, sells about 500 new and used vehicles per month. Google's Leto: Purchases by Hispanics will make up 18 percent of new-car sales. Google, the giant search engine, has been compiling data on Hispanic shopping habits. Peter Leto, Google automotive industry strategist, said Google data show Hispanics are expected to purchase 1.9 million new vehicles in the United States in the next 12 months, or 18 percent of total expected new-car sales. Hispanics make up about the same percentage of the U.S. population, or 55 million people. Google statistics show that the average Hispanic new-car buyer is 39 vs. 51 for the average buyer in the U.S. That means dealers can sell three more vehicles to that person over his or her lifetime compared with the 51-year-old, Leto said. Moreover, Hispanics tend to bring their families to the dealership to make the purchase, offering the dealership an opportunity to sell additional vehicles and service to family members, Lopez said. 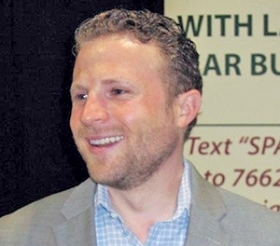 Mat Koenig, CEO and founding partner of a Spanish-language vehicle shopping site, BuscadorDeAuto.com, said it's crucial to reach Hispanics in the language of their choice. Consequently, dealerships should advertise on Google, Facebook and other digital formats in English and Spanish, he said. Lopez said just 16 percent of Hispanics in the United States speak no Spanish. Another 25 percent speak no English. The majority are bilingual. Because as a group they like to share information with family and friends, it is important to give them a choice of language with ads and vehicle information, Lopez said. Hispanics also tend to use their mobile devices and watch videos while shopping more often than the average population, Koenig said. That means marketing must be mobile-friendly and include a good mix of videos, he said. Few dealerships today are advertising in Spanish, Koenig said. At a workshop here last month at the Digital Dealer Conference & Exposition, Koenig asked how many of the 200 people attending the session advertised in Spanish. Just a half-dozen people, which included many tech-savvy dealership staffers, raised their hands. Hispanics account for about one-third of the car buyers at Kuhn Honda in Tampa. But Internet sales director Joshua Smith believes the store should be doing better. Sporadic efforts to reach Hispanics on Spanish-language TV and radio in Tampa have yielded few sales, he said. So as Kuhn Honda launches a new media campaign to promote the opening of its new location -- a $16 million store near Raymond James Stadium -- Smith said the dealership is pausing its Spanish-language pitch until it can devise a targeted strategy that will be heavy on online tactics and may include other media. He said he's learned from trial and error that Hispanics can't be messaged as a single group but as dozens of cultures that have arrived in Tampa from Cuba, the Dominican Republic, Puerto Rico, Colombia, Mexico and elsewhere in Latin America. Smith said Tampa is bustling with Hispanic car shoppers. On any given day, Facebook analytics show that up to 80,000 Hispanics in the area are seriously shopping for a vehicle. Kuhn Honda expects to get more than its fair share of those sales eventually, Smith said. Ten of the store's 30 salespeople speak Spanish fluently, he said. At the new location, which opened March 1, the store is selling about 250 new vehicles and 150 used vehicles per month, Smith said. But the dealership is gearing up a $75,000- to $100,000-per-month TV and media buy in the Tampa market, he said. When the pieces are in place, he said, a Spanish language campaign also will launch.